to coincide with the 25th anniversary of CSI (formerly CSICOP). A Life's Journey from "Believer" to "Skeptic"
"Turn on Channel 2! Turn on Channel 2! That's what I saw!" I was a high school sophomore or junior when she phoned excitedly that Saturday afternoon. Although I had been a science-fiction buff ever since I can remember, and probably had seen the film a half-dozen times before, my grandmother never was and never had. I got up from the sofa and, as I tuned into the station, I immediately recognized one of my favorite movies as a kid: Earth vs. The Flying Saucers. Within minutes, a classic saucer-shaped craft would slice the Washington Monument in two. I ate it up. It's not that I looked forward to the prospect of interplanetary war. But for years I had yearned for a real saucer to land in Washington or New York, so that what I knew to be the hidden truth would finally come out. I was a firm believer in UFOs and alien visitations. And in large part I can thank my strait-arrow grandmother for that. I was probably ten years old or so when she first told me about what she, my grandfather, and uncle had seen around 1950 -- the year I was born -- at a time when UFOs were in the news on a fairly regular basis. Driving home one Sunday afternoon from Frederick, Maryland, to Baltimore, my uncle, who was sitting in the back seat, noticed something odd in the sky. My grandfather, upon seeing it himself, pulled the car over to the side of the road. As all three sat watching the noiseless object flutter about, within a minute or so it would disappear from their field of view. They also noticed that a couple of other cars had pulled over to watch as well. Although my uncle has described its shape as that of a "stovepipe," and assumes that the object was an experimental aircraft of some sort, my grandmother recalled the shape quite differently (I don't remember my grandfather ever adding anything to her version). 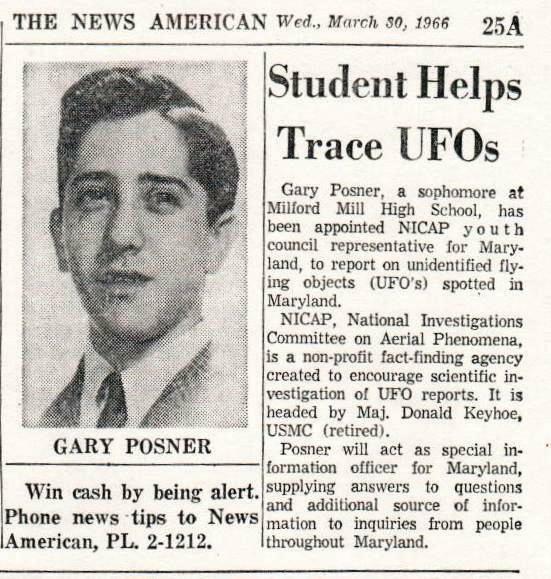 And I was sufficiently impressed by her story that, by the time she called me that day in 1966 or 1967, not only was I a dues-paying member of the largest pro-UFO organization in the country, I was its Youth Council representative for the state of Maryland. I had purchased Klass' book UFOs: Identified during my years of UFO activism, just so I could have a "skeptical" book among my collection of UFO paraphernalia. I decided that it was time to reread it. And this time around, I found it to be quite persuasive. But the book concentrated on only a small subset of UFO reports -- those involving glowing objects that Klass thought might be explainable as something in the "plasma" family, a rare electrical atmospheric phenomenon related to ball lightning. Thus, I was motivated to write to him with questions about several classic cases which, if genuine, seemed explainable to me only as extraterrestrial spacecraft. That same week, I decided to buy The Hynek UFO Report, and sent a three-page letter to Dr. J. Allen Hynek, the country's premier UFO proponent and founder of the Center for UFO Studies. I told Hynek that his new book "left me as perplexed as ever about what, other than hoaxes or [ET] spacecraft, could possibly account for some of [his] better cases." I zeroed in with pointed questions about several classic UFO photographs. And I went on at some length about Klass' book, mentioning that although it concentrated on plasma-type reports, "each time I arrived at a passage which I found particularly weak, or which evoked a specific question in my mind, the following paragraph would either admit the weakness of that particular statement, or contain clarifying material to answer my question." I soon received in the mail a paperback edition of Klass' newer book covering many of the most famous "unexplained" cases, UFOs: Explained, which I never even knew about. In it, Klass inserted a note inviting me to write back if the book didn't answer all my questions, adding that I could reimburse him the book's $2.45 cost if I found it worthy. At about the same time, I received from Hynek a two-page letter whose first paragraph read: "Thank you for your most excellent letter of December 27th. Because you have taken the time to write in considerable detail, I am putting your letter ahead of the stack to acknowledge it." But, as they say, the Devil is in the details. Despite their comparable degree of graciousness in replying to my inquiries, the contrast between the substance of their responses helped spur the completion of my metamorphosis from a now-somewhat-skeptical believer to a full-blooded skeptic. I wonder if you are aware that in his second book, UFOs EXPLAINED, [Klass] refers not at all to his first book, UFOs IDENTIFIED, in which the plasma theory was put forth, and now resorts almost entirely to considering UFO reports as hoaxes, hallucinations, etc. . . . The plasma theory was so effectively shot down that . . . he appears embarrassed [by] UFOs IDENTIFIED. . . . I urge you to read UFOs EXPLAINED and to note in particular [how] when he can't find serious evidence, he resorts to character smearing. This is hardly the scientific method. This is simply not so. On pp. 111-112 (paperback, 1976) he mentions the name of the book, lists the publication information, and summarizes the plasma-family theory. On p. 119 he again mentions the book by name, while discussing a plasma-like case (which was probably a hoax). Page 121 also contains the name of the book, and Chapter 17 deals with the possibility that the tail of a meteor, under certain conditions, might generate plasmas. In addition, the Socorro and Hill chapters both contain footnoted references to his first book, which he mentions by name, and to which he refers the reader for additional details.
. . . It seems to me that when Klass offers "answers," they are simply unwelcomed by you, despite the persuasiveness of his arguments. . . . Since, at least to this reader, you discard the possible answers, it is not surprising that, as you are forced to admit, you have none. It was 7 p.m. before I left the office, exhausted from a hard day probing a very controversial international aviation issue, and by a cold and hacking cough that should have sent me to bed but for the press of Aviation Week business. But your letter [to Hynek] has moved me almost to tears and so I must respond tonight and express my thanks. Soon after I entered the "Strange Land of UFOria," I realized that I had undertaken a largely thankless task. That for most people, who think the whole issue is nonsense, I was on a fool's errand, while for those who are interested and who generally are "believers," my efforts would evoke only harsh criticism. . . . But your letter of Jan. 23 [to Hynek] is ample reward for all my efforts -- truly. What you have dared to say to the "Galileo of UFOlogy" [as Hynek had been dubbed in a recent issue of Newsweek] has long needed to be said. . . . You are the first, to my knowledge, to brazenly comment that the Emperor is NAKED! 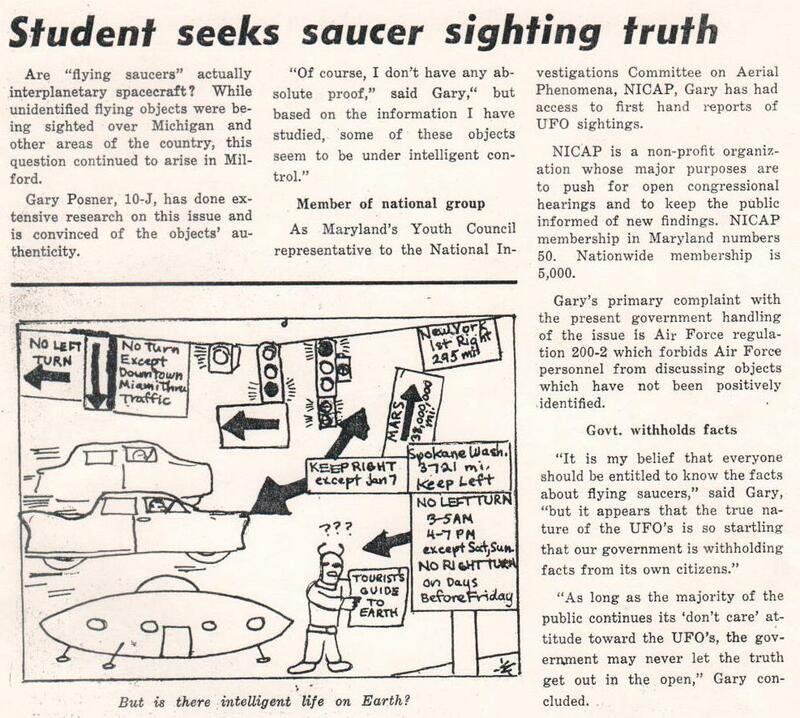 It turned out that Klass was scheduled to deliver a lecture on UFOs at the University of Delaware in several months. Living in DC, and with me in Baltimore, Klass suggested that he pick me up on his way, so that we could talk UFOs at length. That we did, and we became lifelong friends in the process. It was during that trip that Klass formally introduced me to the concept of "critical thinking," which had previously occupied a black hole in my education, despite a Phi Beta Kappa key and medical degree. In 1976 Klass had been selected as one of the first Fellows of CSICOP. 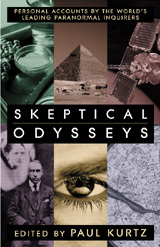 During our trip he told me about their journal, Skeptical Inquirer (originally named The Zetetic), and I soon began subscribing and attending CSICOP's national conferences. Thanks to Klass and CSICOP, by late 1978 I would find myself becoming inexorably drawn into the "paranormal" quagmire.